Ever since cognitive science emerged as a “science of consciousness,” we have been confronted with a challenging question concerning the self-understanding of phenomenology, i.e., the question of how we should think of the relationship between phenomenology and cognitive science. In considering this question, one possible position that one could take would be to clarify the proper character of the “philosophical question” in contrast to that of the “scientific question” concerning the issues of knowledge. 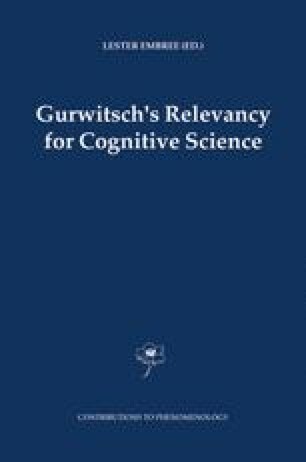 Then it could be argued, for example, that cognitive science deals with “cognitive process as a fact,” whereas phenomenology deals with “the conditions of possibility of cognitive process.” But such an argument tends to lead to a contrast between the scientific approach in general (including cognitive science) and the philosophical approach in general, and to pass over the issue proper to cognitive science, especially that of its methodology. In this essay I will not take this position. Firstly, I would like to clarify the philosophical implications of the emergence of cognitive science in connection with phenomenology. In my opinion we could gain a clear picture of the issue if we take the concept of “systems” into consideration as the medium between phenomenology and cognitive science.